My friend John, being a Cornwall resident and therefore "in the know" with his fellow locals had agreed to let me know immediately if the Grey Catbird was refound. He had "dipped" on the bird the evening before and even though I had seen it, Mrs Caley hadn't, so I was keen to revisit the twitch again. Throughout the evening plans had been laid down by the eminent birders of the area with assistance from the owners of Treave Moor House (just a hundred yards or so away from where the Catbird had last been seen) to open up the field next door for parking in anticipation of the twitchers arriving in the morning. I followed Twitter avidly on waking and was soon reading a steady stream of Tweets from those birders that were already on site. The parking arrangement was working well and a photo showed that the twitchers were lined up opposite the willows at a much more reasonable distance away than before so the bird itself would have more space, that's if it was still present of course. 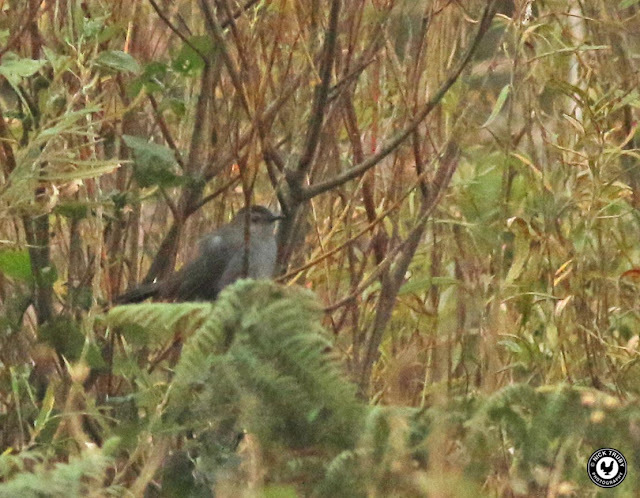 By the time we left the cottage at around 08:30 there had been no sign of the Catbird! 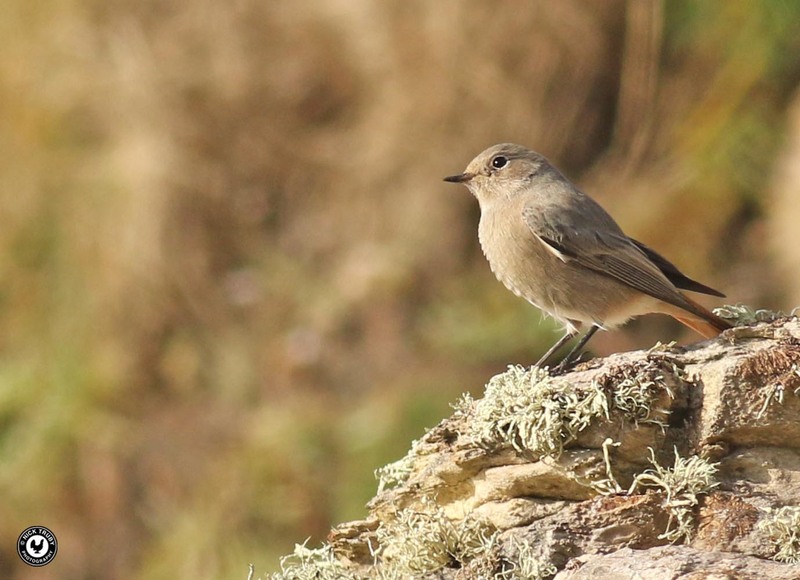 Until we knew for sure that the Catbird was still there and had survived the night we felt it was prudent to remain close to Lands End and close to our car! 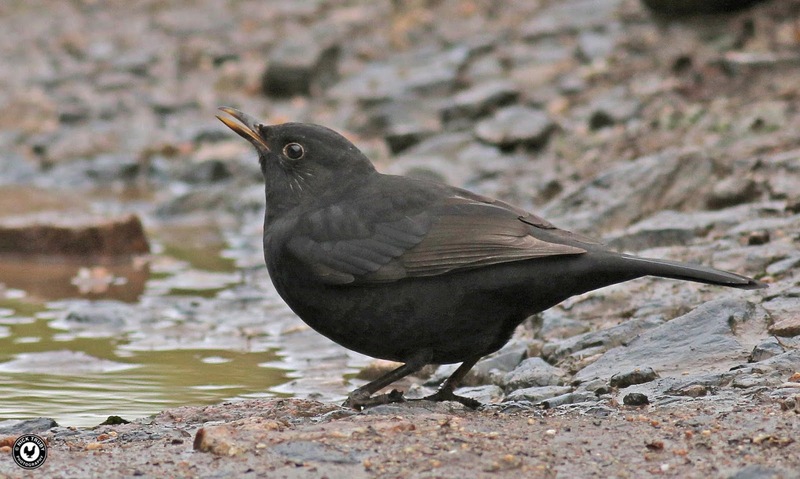 It would be no good at all to go walking a long way away and to be out of "mobile signal" should we get positive news of the bird and have to move fast (ok I know, well as fast as we can anyway). 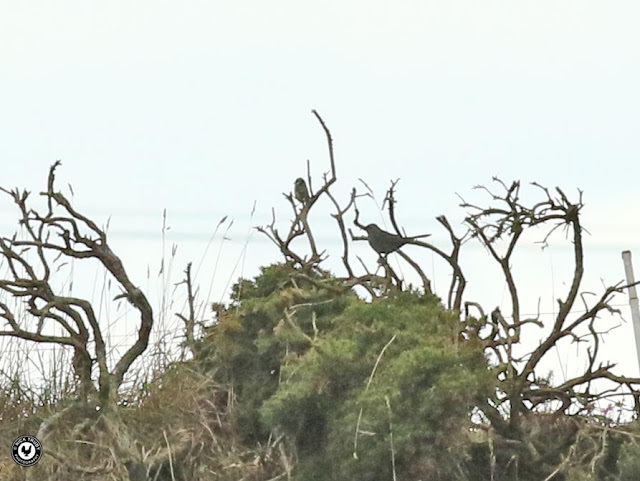 However it had turned 9 o'clock so I thought that should the bird still be there, then it would have been called by now so we decided to go and look for a Wryneck at Polgigga that had been around for over a week. 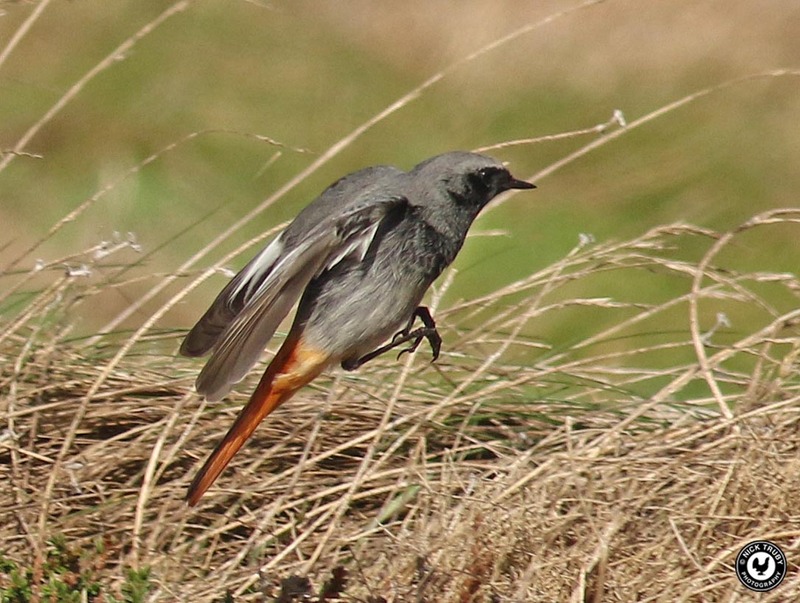 Polgigga is only a few miles away from Lands End, just in case the Catbird resurfaced. At 09:22 I had just opened the car door at the parking area next to the lane where the Wryneck was purported to be when I received a message from John, "Bird showing, I'm going". Probably one of the most poetic (well it rhymed) and succinct messages I've ever been sent. Car door was shut and less than ten minutes later I was driving across the same field that we'd entered and exited the afternoon before to find a parking space in amongst the hundred or so cars already there. We could see the line of twitchers, maybe about 200 in all, stood in a long line and all peering intently at the same willow bushes that the bird had frequented the evening before. Not wanting to make the same mistake again this time we walked around the house and directly on to Treave Moor and found a gap, from where we would have a good view, amongst the assembled throng. 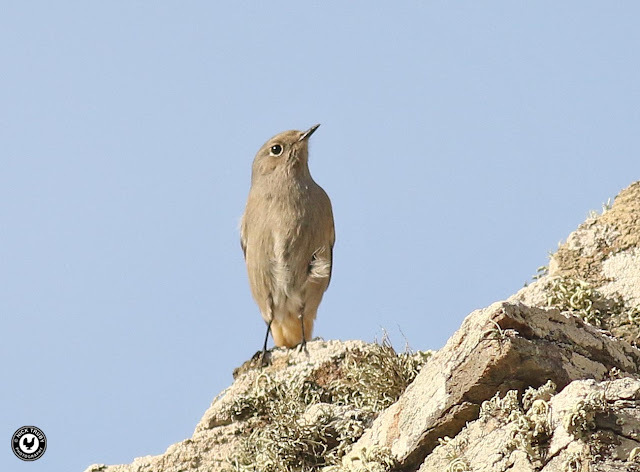 There was much excitement among the crowd, most had seen the bird albeit it briefly, and the anxiety that we had felt the day before had dissipated. 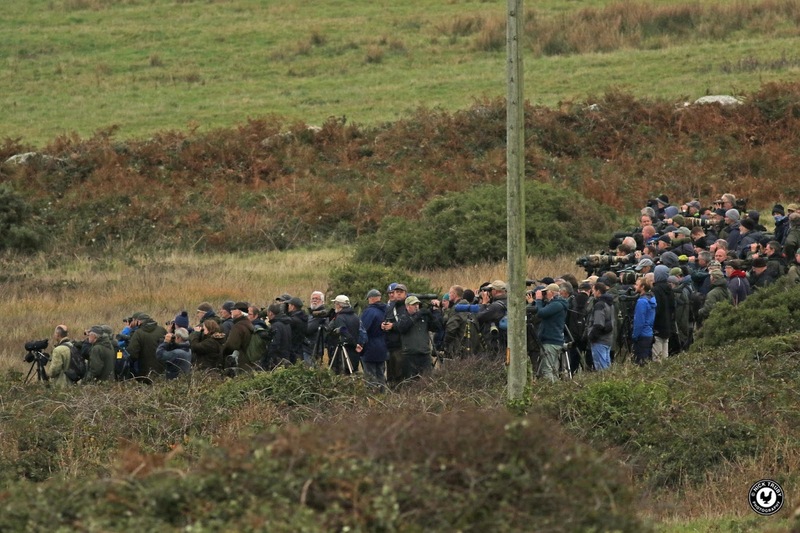 This assembly represented a large proportion of the nations most determined twitchers and many had travelled through the night from far and wide to be on site at first light. Twitching at the top level takes great dedication, not to mention a lot of financial outlay and the keenest twitchers and list builders are completely obsessed in their aims to see the rarest of birds that land in the UK. I had researched into the status of Grey Catbird and the reason I couldn't recall too much about the species was that the only British record was the bird in Anglesey and that was as far back as 2001. That was also an incredibly skulking bird and was only seen by a handful of people so was what is known as a "blocker", a bird that a lucky few had on their lists but one that most didn't. And now a large number of twitchers had "unblocked" the blocker! All we had to do is see it for ourselves and get better views for me and the tick for Mrs Caley! We didn't have to wait long as within ten minutes of arriving the Grey Catbird materialised in almost exactly the same spot as I'd seen it yesterday. Thankfully high enough up at the base of one of the willows for Mrs Caley to see it too. We could both relax now! I reeled off some record shots, all completely useless of course except for posterity purposes and then watched the Catbird at length since it remained perched in the same spot for quite a while, no doubt wondering what all the fuss was about. It even called and when it did then the reason it's been named a Catbird was evident since its call resembled the "meuw" noise made by a Cat. The Catbird retreated back into cover as the noise from its ever growing appreciation society increased as birders related the experience and made and remade acquaintances. We chatted to John who was now understandably delighted at having secured views of the rarity having missed out the evening before. Mrs Caley and I have twitched many birds before but this was the first time we'd been party to a twitch of this magnitude of such a very sought after rare bird. Usually, if a bird grabs our attention, we're a few days behind the first wave of twitchers when things are much more leisurely. This was a different ball game to what we're used to. 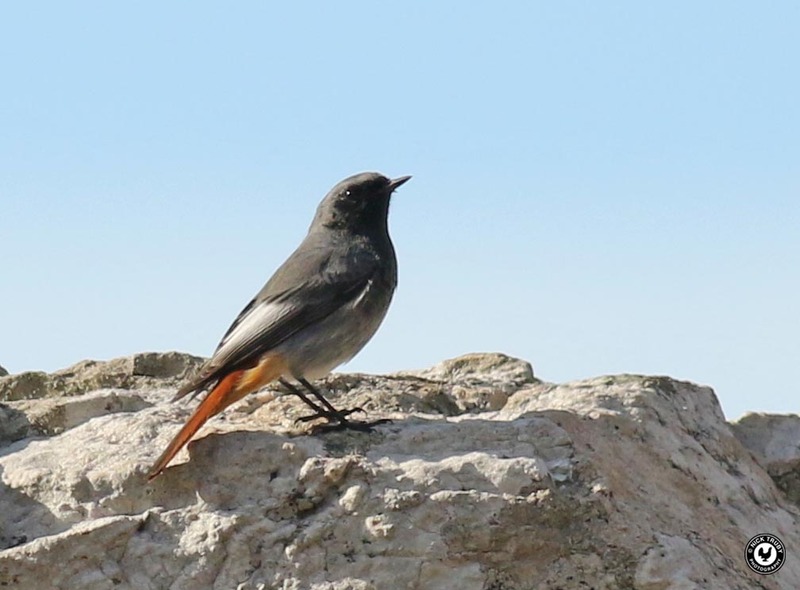 We have been in Cornwall when rare birds have been found before, Yellow-billed Cuckoo and Red-eyed Vireo for example, but were always on site quickly before many birders had arrived. Twitches such as this one are not for the faint hearted! What happened next distressed me a little bit more after my guilt overload of the previous evening, it seems I must have more than a bit of the eco warrior in my make up. 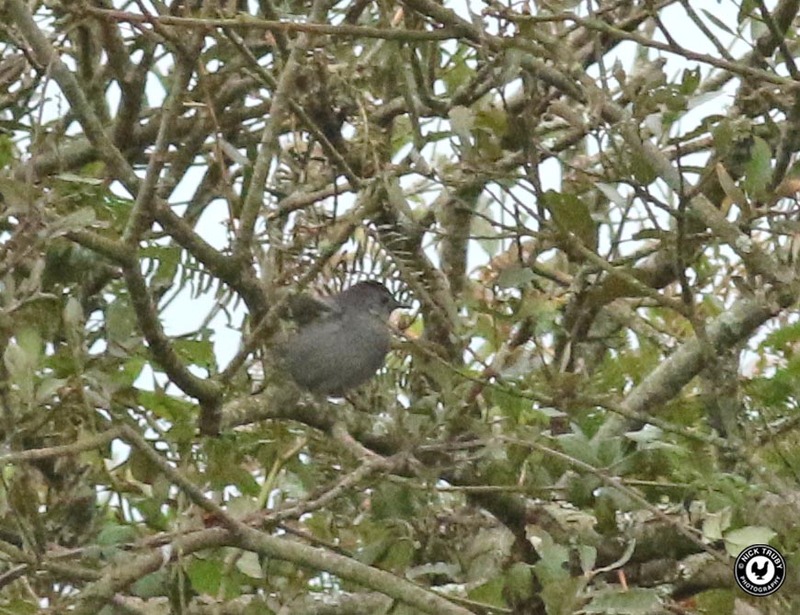 Firstly the Catbird, thankfully, popped back up in the willows once more but flew immediately into a small hedge about 50 yards away. I managed to grab a couple of photos, still complete rubbish mind, before the bird moved further along the hedge. This started a mini stampede amongst the more eager of the twitching brigade and they rushed towards the Catbird. 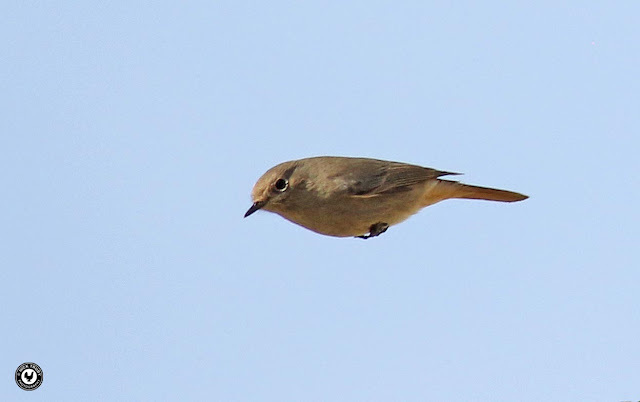 The bird then flew out over the hedge and to another hedgerow further away. It was followed by its entourage across an open field so that they could secure "better" views. For the next half an hour or so the army of Catbird admirers hounded the bird around the moor tracking it very skilfully but since it never remained put for very long so the admirers were also very mobile in the pursuit of it. It seems there was very little, if any, regard for the bird or the private land on which they trod. 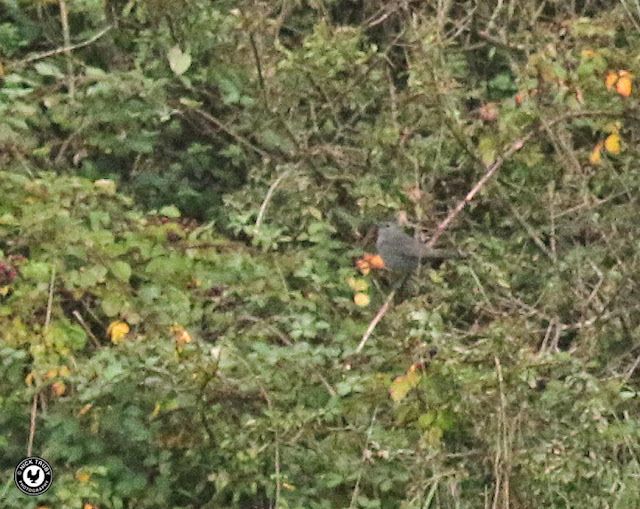 The Catbird started moving back towards its original position and we could now see it again working along a hedgerow at the back of the field opposite our viewpoint. It finally settled down for a length of time in a thick bramble hedge next to a tyre dump. This was inaccessible to the twitchers and there the Catbird appeared to feed and often perched openly for plenty of bad photos to be taken. I was more than a little bit perturbed since, as per the evening before, once again the Catbird was being harassed when all it really wanted was to settle down and feed and I, being part of the twitch, felt the guilt once more. 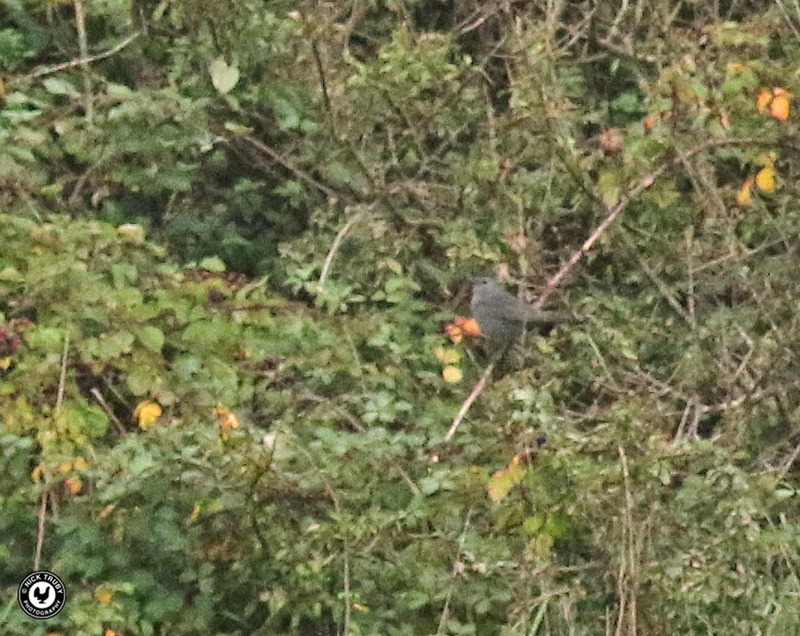 In actual fact, as it turned out, I shouldn't have worried since the Catbird subsequently remained for a couple of weeks in the same area so appeared quite happy with the attention. Time to "man up"! 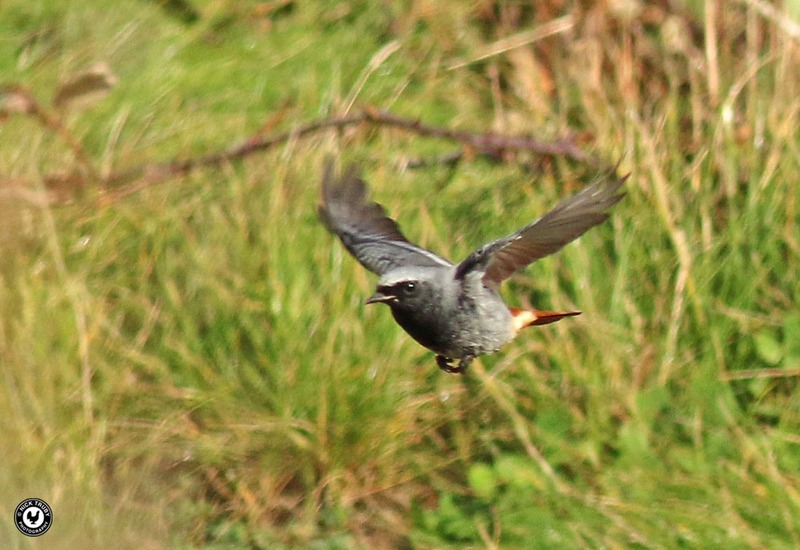 We watched the Catbird for a while longer and then departed to look for the Wryneck as we had intended earlier. On our walk along the lane we met a birding group who had just seen the Wryneck although it was proving, as they do, elusive and difficult to see. The Wryneck was frequenting a small overgrown allotment area close to a farmhouse and in particular an elder bush close by. There was no sign of the bird anywhere when we arrived so we sat down on a stone stile and waited. Wrynecks love deep cover and spend long periods out of view as they feed among tangles of brambles and scrub. 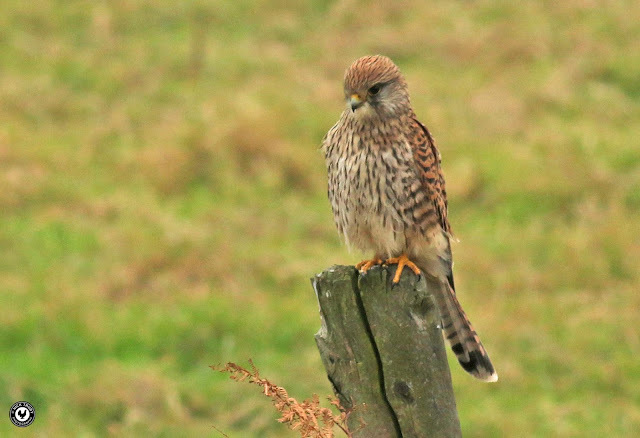 Fortunately they also like to pose from time to time on vantage points such as a fencepost or a tree branch where they stay motionless except for the steady movement of their heads as they take in their surroundings. So, since the bird had been seen just a short while ago, we fully expected it to pop up into view at any moment. Of course it didn't, not for us anyway. Our hopes of seeing the Wryneck were well and truly dashed when a group of birders fresh from seeing the Catbird came along to also look for it. Sadly their patience didn't match our own and within a few minutes one of them was marching through the brambles in an attempt to "flush" the bird. A practice that I absolutely abhor. Unable to compete, and not wishing to stay in the company of such protagonists, we left and headed off for a coffee and lunch at the excellent Apple Tree Cafe in nearby Trevescan. We spent the afternoon back in the Kenidjack valley doing our best to avoid the roaming hordes of twitchers. It would seem that a major drawback of having a very rare bird in the area was that once birders had seen the Catbird they then naturally wanted to fill their day by seeing some of the other birds that had been reported in the area. 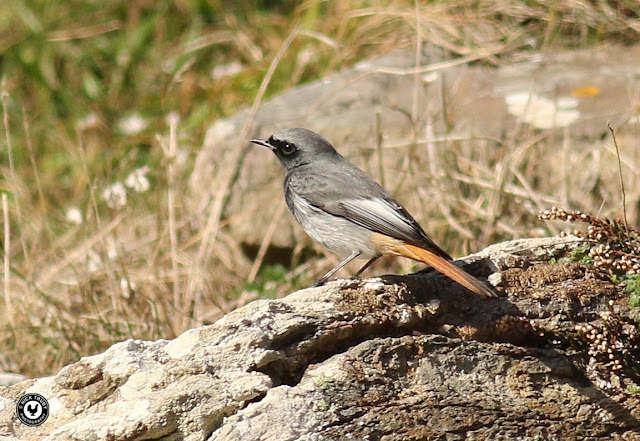 Most head to hotspots like Porthgwarra but others were attempting to see birds such as the Wryneck and the Yellow-browed Warblers in the Kenidjack. There were birders everywhere and, having secured the Catbird, were leaving much to be desired in the name of fieldcraft. Hence our move was to rush down to the cove at the seaward end of the valley and seek some respite there. Don't forget we were on our holiday still! 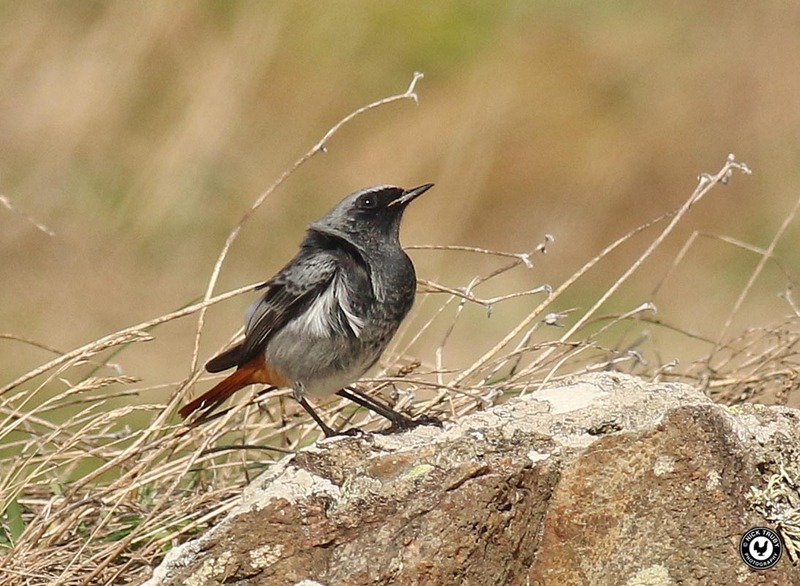 In contrast to the murky conditions of the previous day we were now able to enjoy the Black Redstarts, all three of which were still present, in glorious sunshine. 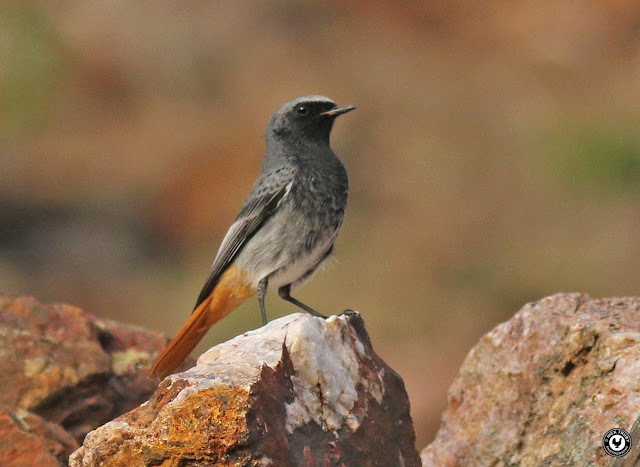 The resplendent male bird was far more confiding this time too and actually approached closely as we sat on the rocks enabling me to get some better shots than the day before. 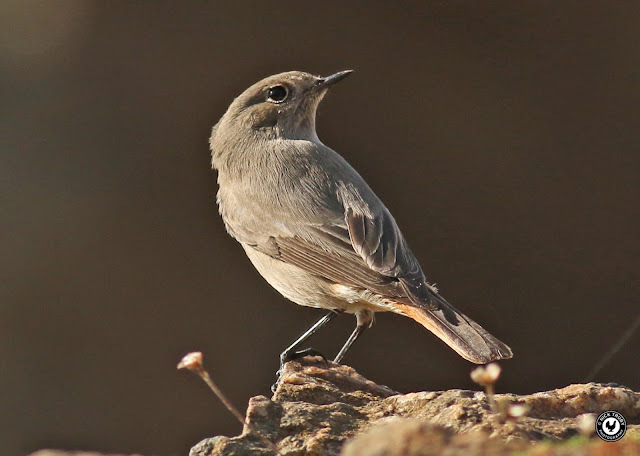 One of the juvenile type Black Redstarts was even more willing to give itself up for fine views and photos, often coming to within twenty feet or so. 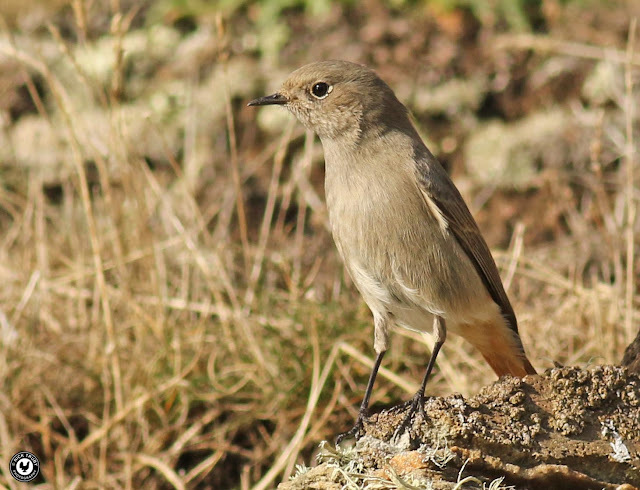 With close views you can appreciate why these birds are so good at hunting flying insects. Their eyes are huge proving that they must have excellent vision aiding them in locating their food. The black and grey plumage helps the birds blend in excellently with the tonal colours of the surrounding rocks and cliffs making them hard to see by potential predators. 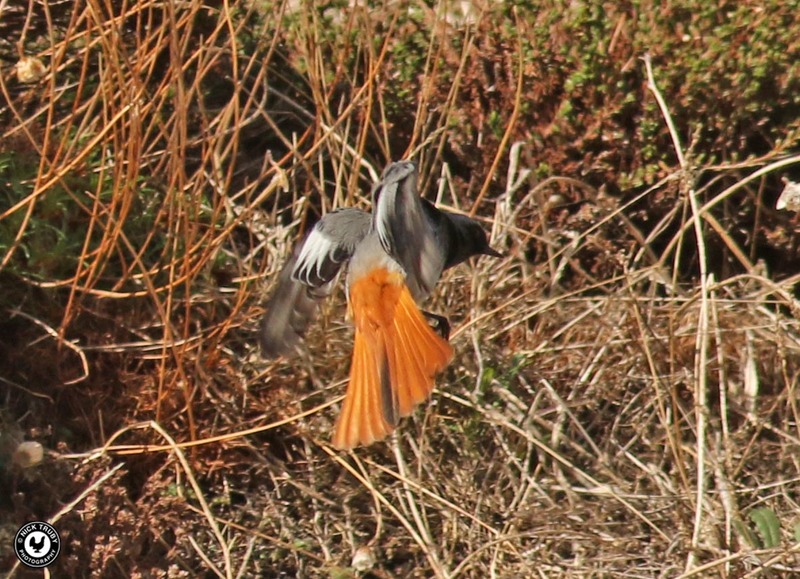 When the birds flit up to catch an insect or move from one rock to another, then the flash of the bright red tail enables you to track them. I tried again to capture the birds in flight with marginally more success than my previous efforts of the day before. We stayed with the Black Redstarts for nearly two hours just chilling out and taking photos. We were blessed with some sunshine too and the cove was completely ours to savour, no other people ventured down there at all. Bliss! 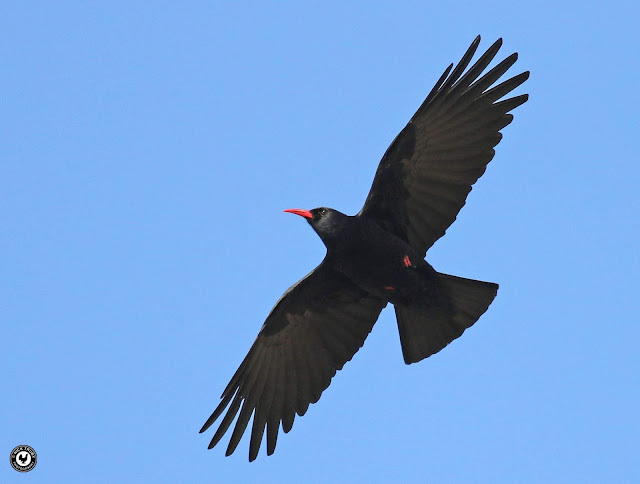 A party of four Choughs announced their presence by raucously calling as they flew over the cove. You never have to sit and wait for long before these most acrobatic of our corvid species arrive. 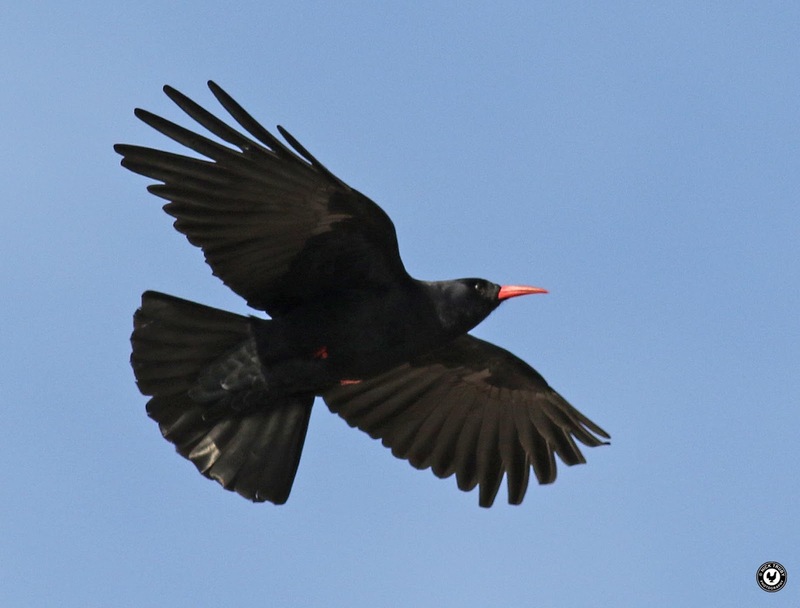 Alternatively a walk along the clifftops in this part of the world will almost always bring views of Choughs. We were briefly joined by a Grey wagtail that alighted on a rock mid-stream just above the beach. 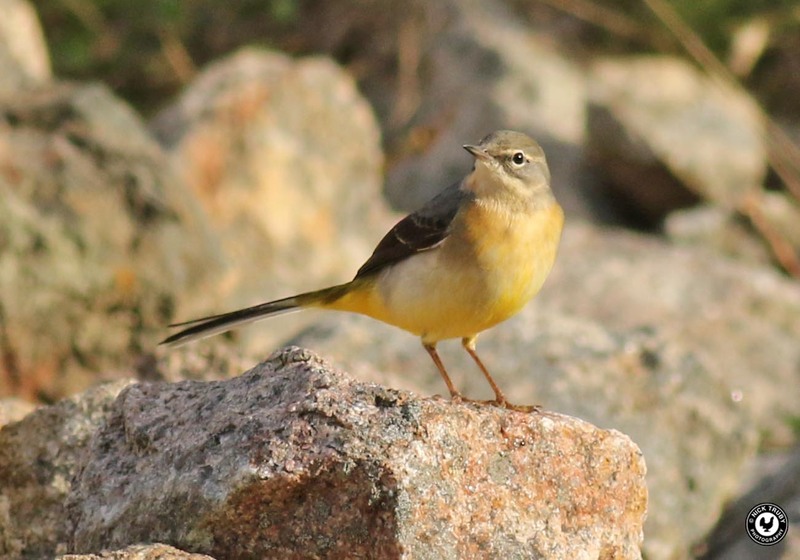 Grey Wagtails are another bird that you are almost guaranteed to see in the Kenidjack Valley. 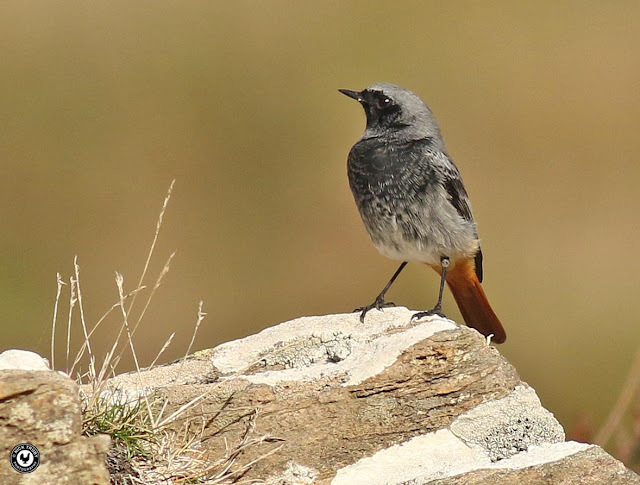 After a last look at the male Black Redstart that had now relocated onto the adjacent scree covered hillside we made our way back up the valley towards the donkey paddocks and sallows where the Yellow-browed warbler had been seen on Sunday. 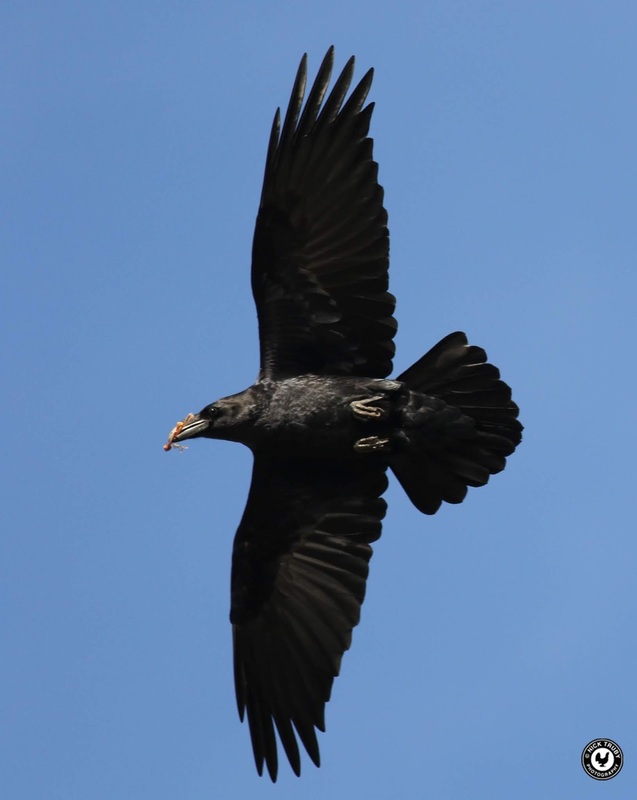 There are always a mob of Jackdaws in this area, they use the mine workings chimney's to nest and as lookouts. We spotted two of the Jackdaws escorting a Kestrel, or it may have been the other way round, out of the immediate vicinity. 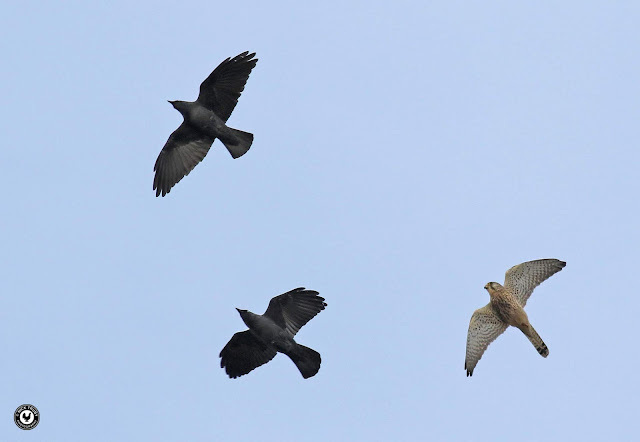 All of those birds are fantastic fliers but the Kestrel was easily outmanoeuvring the Jackdaws. 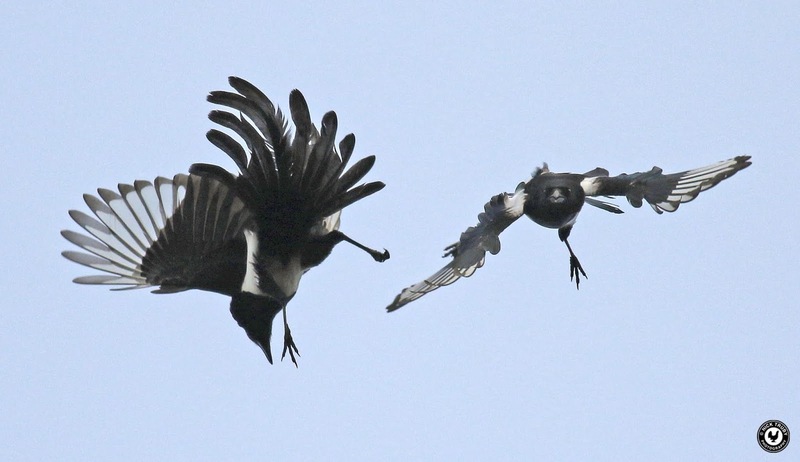 Corvids of many varieties are well represented in this part of Cornwall and there were Ravens and Carrion Crows around too as well as the Choughs and Jackdaws. Not sure what a certain Carrion Crow was about to snack on though? 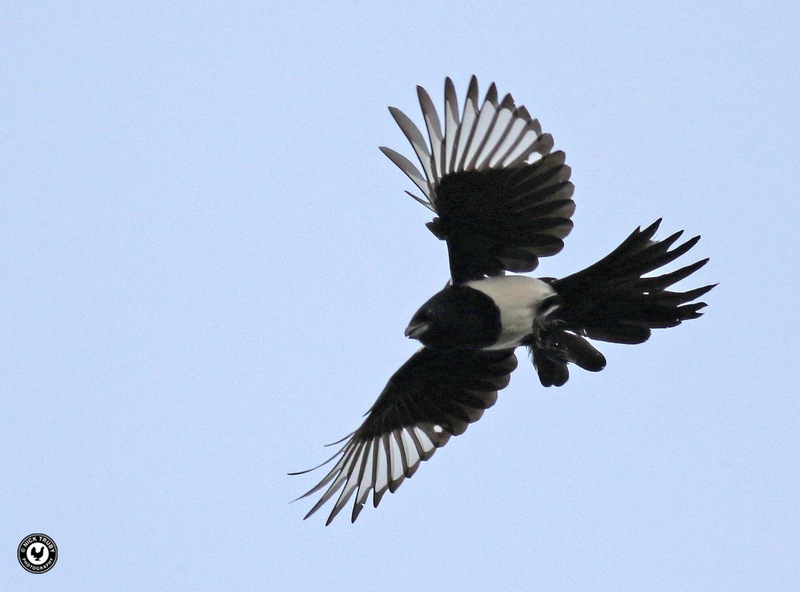 A pair of Magpies erupted noisily out of the large pine trees that grow on the valley's northern side. 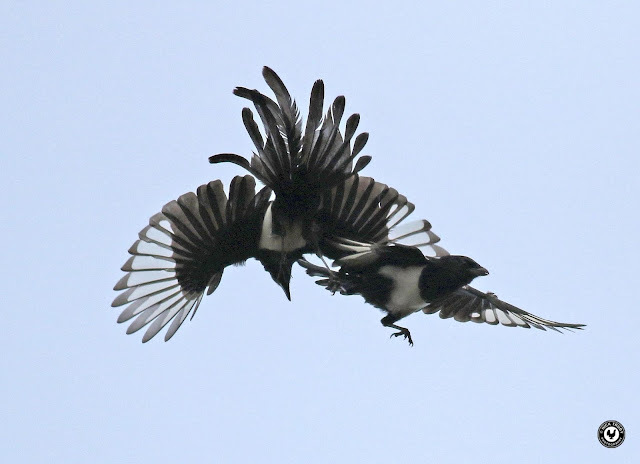 They squabbled at length and then actually began a mid-air scrap. 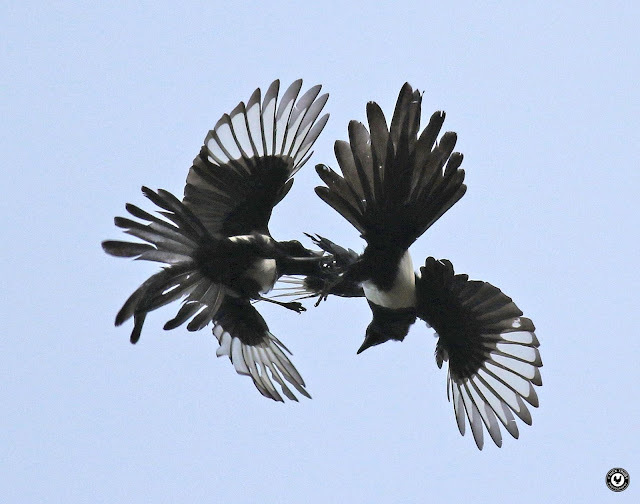 Feathers literally flew as one bird attacked the other and vice versa. 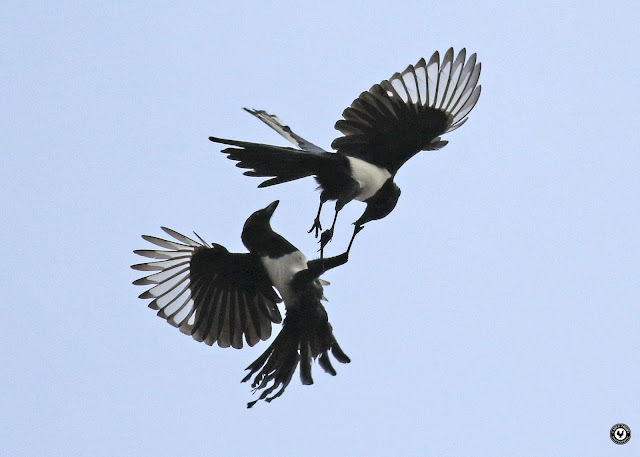 It didn't look at all amiable and lasted for a good minute before both birds returned to the trees again where the noisy disagreement continued from within the branches. There was no sign of any Yellow-browed warblers at the paddocks although I did see my first Goldcrest of the week. The two crest species are normally present in good numbers in Cornwall at the this time of year but were playing very hard to get this year. Blackbirds were again using the puddles for bathing and drinking, hopefully they'll be joined by a Ring Ousel or two soon, and the friendly Kestrel was once more sat on one its favourite staging posts further up the valley. 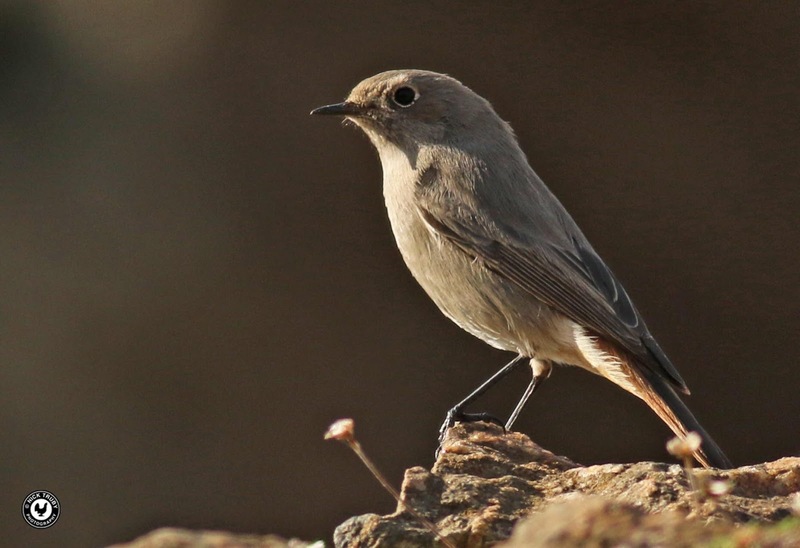 Later that evening the local BBC news channel, "Spotlight" featured a story of the Catbird and a video filmed by John Chapple, a local Cornwall birder. Mrs Caley and I were featured on the original but for some reason, although not surprisingly, the Beeb decided to consign me to the cutting room floor! At least my good lady wife is a local media celebrity. However the full video is attached here, courtesy of John Chapple: Catbird Twitch. Check out the good looking couple loitering on the left edge of the frame at the start! Rosy, Rough and Recorded. 2-5 January 2019.